Integrate Charts and Essay Writing! Integrate charts as a first step in student essay writing, before or even instead of an essay answer. When the information to be included is arranged first in chart form, it is easier to see strengths and possible points of weakness before an essay is attempted. * what headings could be used across rows? * what headings could be used down columns? This makes a great change for writing character sketches, for creating definitions in the sciences, maths, shops, and social sciences. This is also a super way of introducing information collection that virtually eliminates plagiarism since you are requiring words and phrases within a chart format. Stepping it up? 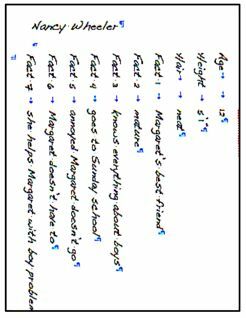 Once charts are produced, use an example or two in a guided writing lesson to show how to build sentences and paragraphs from charted material. Taking it further, assign finished charts so each student receives work from someone else. Using information on the new chart, create the character sketch or report or essay. Encourage students to include reaction to this chart and how it differs or offers other insights from their own work. Return from Integrate Charts and Writing Projects to Integrating Real World Content hub page for even more ideas for integrated teaching steps! Return from Integrate Charts and Writing Projects to Real World Content Advantage home page.